Lights Out! Now Let’s Race! So a package showed up on my doorstep big enough to make any ‘kid’ eager to see what was inside. 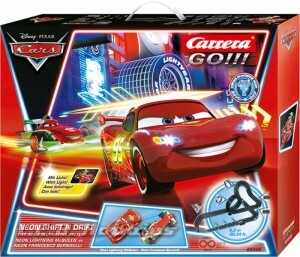 Upon opening the box, I found six new Carrera GO!!! slot cars staring back at me. As if that wasn’t enough excitement from the 1/43 scale world of slot car racing, digging further into the big box, a new slot car set was hiding underneath the packing paper! Now these weren’t just ordinary run of the mill cars, and the set was no ho-hum box of parts either. The cars were all from the DTM series and came in various makes and models, as well as liveries. I have several 1/43 scale slot cars that look nice, but these cars look very much like their full-scale cousins. Seriously, if I didn’t know better, I’d think that Carrera dehydrated the full-scale models creating these miniaturized versions. Maybe I don’t know better. I added water to them, and nothing happened. I thought for sure they’d grow like those silly rubber­like toys I used to get when I was a kid. You know, like the alligator that you put in water and come back the next day to find it over a foot long. Okay, okay, I didn’t really put water on the slot cars, but I’m telling you, the detail that Carrera puts into these little cars is impressive. 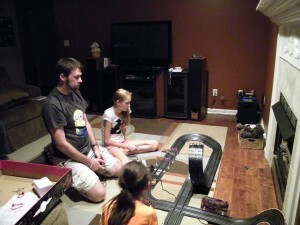 The slot car set is the Carrera GO!!! Disney/Pixar CARS Neon Shift ‘n Drift set. 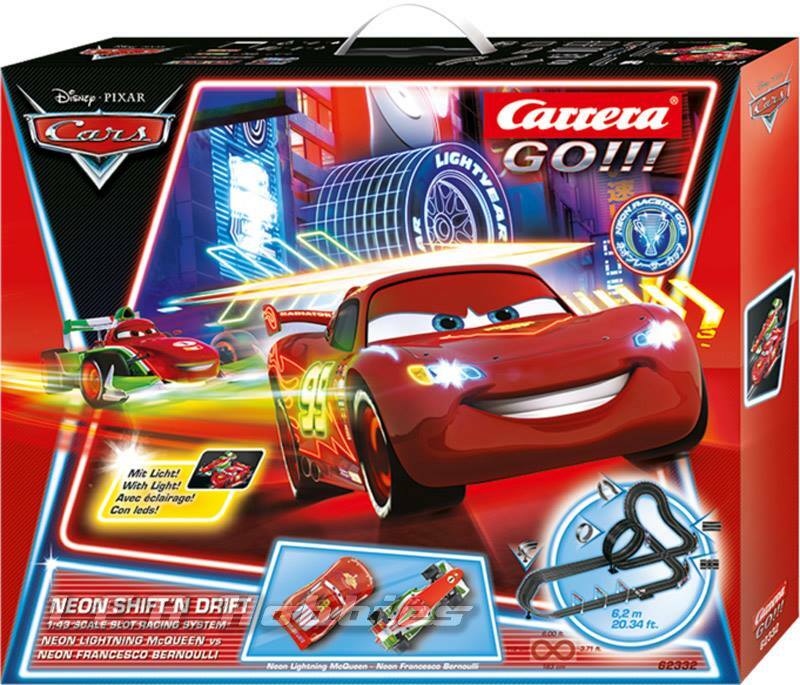 Now, while I’m not much into the slot car sets that are targeted toward kids—which, let’s face it, that’s really all of them—I am a fan of the CARS movies. What can I say, I’m a big kid. 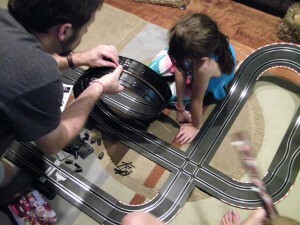 And of course since these sets are for kids, it has a big loop that the cars race around. Umm, yeah, a big loop. No thanks. That’s okay for Hot Wheels, not slot cars. Of course, I had a couple kids, 8 and 11, that I thought may appreciate it more than I did. 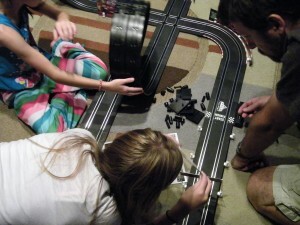 I had them park their cabooses on the living room floor, at which point I put the set down in front of them. At that moment they each yelled a single word simultaneously, “Wow!”, and “Cool!” So yeah, they were enjoying it. Now don’t think for a minute that these are your typical boys who like cars and the movie series CARS, because they aren’t. You see, they are girls. My girls. 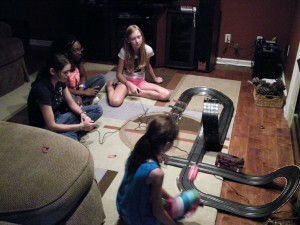 Each raised around cars and slot cars, and of course, fans of just about anything toy related. If they like it, I’m certain most kids, ahem, and adults, will too. While we do enjoy playing board games on the living room floor, this was something a bit different. Not only was it a slot car set, the cars in the set had ground effect LED lighting! Now THAT is what got their attention. 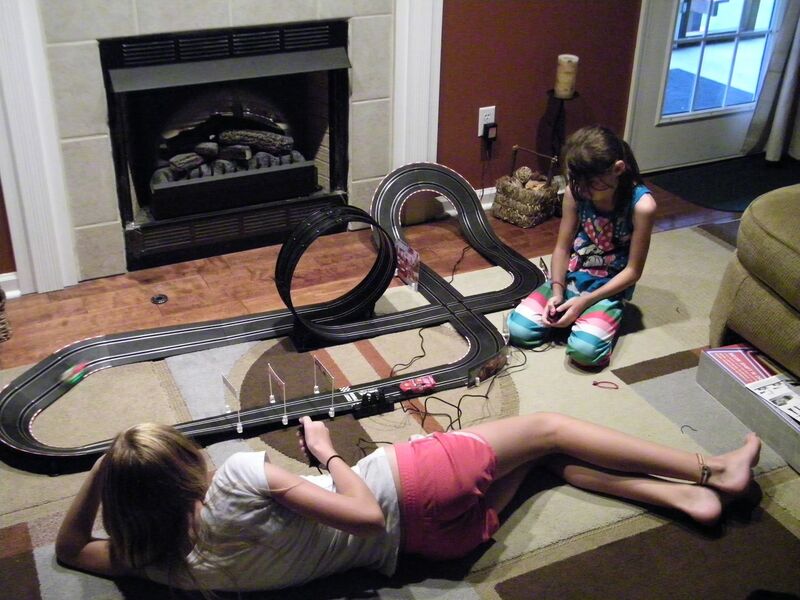 Sure, you can race the cars with the lights on, but what fun is that? So we worked on putting the track together, including all the decorations and such, adjusted the braids on the cars, and the racing began. After getting used to the cars and making some minor adjustments…Lights out! Now let’s race! These cars were a hoot to see barreling around the track with their streaks of green and red light zooming by in the dark. As with most toys though, the kids played for a few minutes and then they were done. Well, long enough to have some birthday cake. You see, my oldest was having her 19th birthday party. After cake, the younger ones and I went back to racing, but who would have thought that a 19-year-old and her friend, also 19, would find themselves racing. Not just racing, but laughing and having a lot of fun! Heck, even my wife and I got into a little Lightning McQueen vs. Francesco Bernoulli battle for first place under the neon lights of Tokyo. Slot car racing: the hobby that all ages can enjoy! 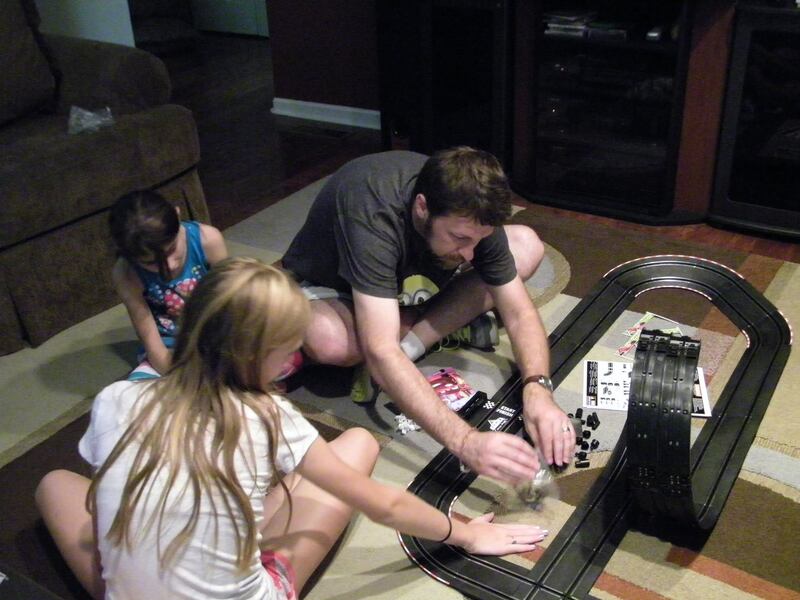 So grab a slot car set, a friend or two, and have some fun! Oh, and remember that loop? Yeah, it was tons of fun seeing those circles of light as the cars whizzed around them. I think I like loops now, but don’t tell anyone, it’s a secret.